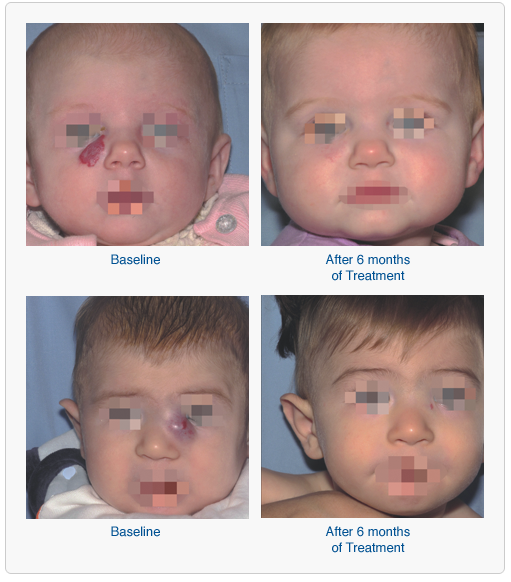 HEMANGEOL was studied in a primary clinical trial of 460 babies with proliferating (growing) hemangiomas (excluding life-threatening infantile hemangioma, function-threatening infantile hemangioma, and ulcerated infantile hemangioma with pain and lack of response to simple wound care measures). To learn more about the safety and effectiveness of HEMANGEOL click here. HEMANGEOL is a clear, colorless to slightly yellow oral-dosing solution supplied in a 120 mL amber glass bottle, with a child-resistant screw-cap. A specific oral syringe and syringe adapter are provided with each bottle. The oral dosing syringe measures HEMANGEOL according to volume in milliliters (mL). HEMANGEOL is available in strawberry-vanilla flavor. *Photographic evaluation not done prior to 5 weeks. Data on file. Pierre Fabre Dermatologie, 2014.